SKM Arc Flash using IEEE 1584-2018! Hear what our clients are saying about SKM! 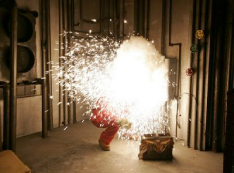 Arc Flash Evaluation calculates the incident energy and arc flash boundary for each location in a power system. Arc Flash saves time by automatically determining trip times from the protective device settings and arcing fault current values. Incident energy and arc flash boundaries are calculated following the NFPA 70E, IEEE 1584, and NESC standards. See how our products can help you save time, ensure, compliance, and save lives. Fault analysis, coordination, and Arc Flash are just a few features in our software suite. Our products are backed by a world class technical support staff that is comprised entirely of electrical engineers. SKM is committed to providing unprecedented training quality and hands-on applications to real-world situations. Securely access software downloads, purchase new studies, renew maintenance, and more at the new My SKM portal!